Andhra Pradesh Aerospace & Defence and Electronics Park (AP-ADE) is a joint venture of Andhra Pradesh Industrial Infrastructural Development Corporation (APIIC), Government of Andhra Pradesh and Vittal Innovation City (VIC). Andhra Pradesh Aerospace & Defence Electronics Park (AP-ADE)is a 260 acres “Manufacturing Cluster” focusing on Aerospace & Defence and Electronics, located in Anantapur district of Andhra Pradesh abutting NH7. It is 50 mins drive from Bangalore International Airport. Bangalore leads its state in having highest skill manpower availability. AP-ADE has a ‘Design to Manufacturing’ approach, which is unique from the other manufacturing parks that are built for the sole purpose of manufacturing or providing land with basic infrastructure. The cluster approach of AP-ADE will help companies to find their vendors and customers at the same location, while reducing their supply chain and other operational overheads through common warehousing facility. AP-ADE also plans to invest in programs and infrastructure to drive innovation like –university, convention centres, training facilities, world-class product testing labs and common design facilities/studios. We also plan to bring in network of professionals with skill sets in technology, IP safeguards, consulting, global alliances for marketing of products, product management training among others. AP-ADE stands apart from rest of the developer-led projects. At the core of our project is “innovation” that fuels the next engine of growth for the country. The infrastructure and programs at the cluster are geared towards seamless integration of academia, industry and community to attract top global talents for innovation. The eco-system created by our project will help small, medium and large scale enterprises to build and access global markets at local costs of infrastructure and skilled manpower. The environment at park will enable continuous learning through interdisciplinary innovarsity, global university campuses, institutional and corporate R&D centres and technical training institutes for skilling/re-skilling. Its integrated eco-system will provide support right from design to manufacturing by leveraging the energy of its KTR (Knowledge-Training-Research) clusters to foster ideas that will rejuvenate businesses. Andhra Pradesh Aerospace & Defence and Electronics Park (AP-ADE) is strategically located in Anantapur district of Andhra Pradesh on National Highway NH7 that runs between Bangalore and Hyderabad, within a driving distance of just 50 mins from Bangalore International Airport. A large number of colleges and educational institutes at Anantapur are a source for quality manpower. There are around 19 Engineering Colleges, 29 ITI Institutes, 10 Polytechnic College, 37 BCA-MCA and MBA Colleges and around 110 Schools. AP-ADE plans to tie-up with key engineering colleges to help deliver courses for skills up-gradation to meet the needs of the industry. Anantapur has sufficient manpower availability and around 30% of the manpower works in the nearby manufacturing industries which would be happy to relocate. 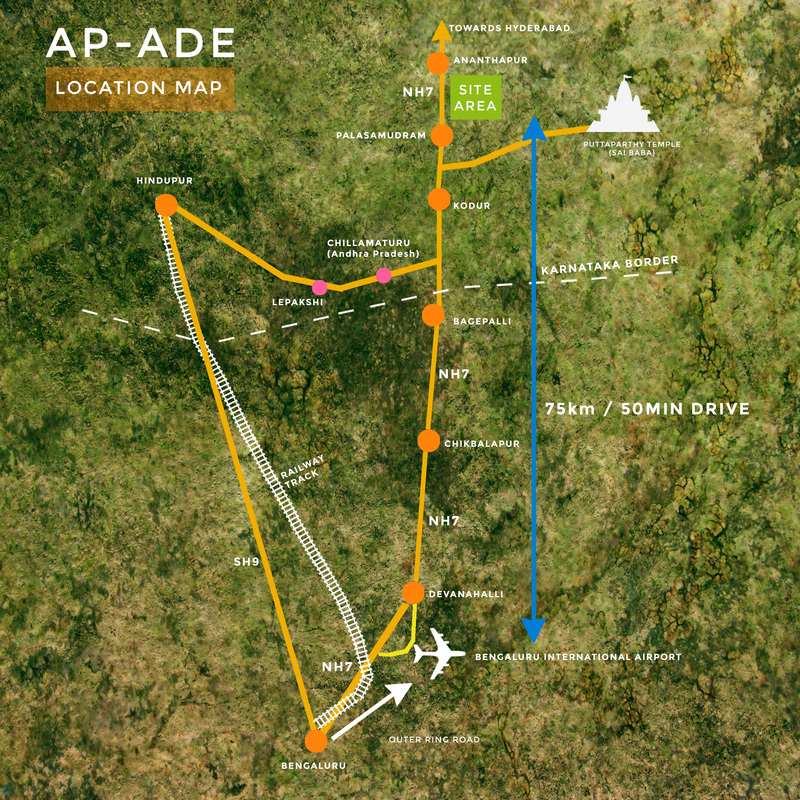 Other than Bangalore airport, AP-ADE is well connected to Puttaparthi airport, 35 kms from site. The nearest Railway Station is Hindupur at a distance of 25 kms from site, which makes it conveniently connect by rail network with major towns, cities and states. Being at a driving distance from various major ports on western and eastern ghats like Mangalore, Krishnapatnam, Chennai, and Cochin makes it truly a globally accessible destination. AP-ADE has best of both the worlds – the cost-advantage of being in AP state and the benefits of its close proximity to Silicon Valley of India i.e Bangalore City – home to many technology companies. Bangalore is the fourth- largest technology cluster in the world after Silicon Valley, Boston and London. It employs about 0.3 million professionals. With a growth rate of 21%, it contributes to 33% of IT exports and is renowned centre of learning, with many famous universities, professional colleges, polytechnics/vocational centres and high schools. AP-ADE’s geographical and strategic location makes it truly an advantageous & lucrative innovation investment destination in India. At 25 kms distance, Hindupur is the nearest railway station from AP-ADE. The railway station is well linked to Hyderabad, Bangalore and other states. AP-ADE is positioned as a eco-friendly world-class city. It will have urban mobility and public transport, robust IT connectivity, assured water and electricity supply, sanitation and solid waste management. AP-ADE will have latest STP and ETP ZLD Technologies, which treat wastewater without the use of chemicals. Apart from these basic infrastructure facilities, AP-ADE will help equip the city with smart solutions that will provide adequate quality of life with focus on clean and sustainable living and work environment making it truly an eco-friendly and green cluster. With its abundant infrastructural facilities and futuristic planning, AP-ADE will help foster balance between work and life. AP-ADE is founded on sustainable establishment principles that allow scalability and expansion without any impediments. The key zones within park will be vibrantly habitable, bringing alive the elements of life to Work – Live – Learn – Play – Create for people living in the city. AP-ADE has a plain topography which is ideal for manufacturing. The layout and plan is designed to offer land parcels ranging from 1.0 acre to anything larger than that to set up companies. The WORK ZONE – will include a Special Economic Zone (SEZ) for export oriented enterprises, and a Domestic Tariff Zone (DTZ) for businesses catering to the domestic market. The LIVE ZONE – will comprise of residential complexes, healthcare, and other living amenities. The LEARN ZONE – will have educational institutions for all levels of education and skill development. The CREATE ZONE – will provide incubation, ideation and R&D centres for new companies to innovate. All the zones will be interconnected with a network of steeled roads, uninterrupted power & water supply, urban mobility & transportation and provision of solid waste & wastewater management to be sustainable and have smaller carbon footprint. AP-ADE offers all the basic social amenities to the stakeholders within the city. It is well connected to various cities in AP state and Bangalore by road, rail and air.